Kakuro are easy to learn yet highly addictive language-independent logic puzzles now following the footsteps of the worldwide Sudoku success. Requiring just pure logic and simple add/subtract calculations, these numerical-crossword puzzles will carry you into a fascinating world of number combinations you never imagined could exist. 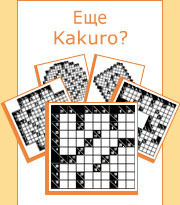 If you like Sudoku and other logic puzzles, you will love Conceptis Kakuro as well! The secret to solving Kakuro puzzles is learning how to use magic blocks – those special situations where only a single combination of numbers can fit into a block of a given length. For example, if 6 is the sum-clue of a block of three squares then the block must consist of the numbers 1+2+3 but not necessarily in this order. When spotting a magic block, the Magic Blocks table can be helpful to identify which unique numbers must be used in that block. The only thing left is to find out in which order the numbers should be organized. This Kakuro Magic Blocks table shows all the magic block possibilities which may occur in Kakuro puzzles.